There are quite a few new ancients rules out now, or on the horizon. I'd like to give each of them a chance, if I can. So when I had a few minutes to paint and decided to do a bit of painting for myself with that time, I went back to Rome. I can already field a decent sized Rome vs. Cimbri/Teutones game. But I've also had Rome vs. Rome in mind as an eventual goal. So I'm painting more Romans. I went with a simple scheme again, and did a bit of speed painting, but without the dip. Nothing terribly special, but exciting for me as it's the first real painting I've done for myself in a while. I've also pulled out a unit of Spanish cavalry that I had started ages (a year?) ago, and may try to get to that next, while I prep some more Romans. I think I may indulge my Plutarchian fondness for Sertorius, and start with a Rome vs. Rome & Spain goal. I think this may be a good way to throw in not only a lot of Roman legion, but see how the different game systems handle different types of lighter and/or "barbarian" troops. Since it's been a while, I thought I'd try to post some extra photos. So here's a few old Lance & Laser figures I painted for Armorcast, who is the current manufacturer. I'm still contemplating the addition of some small emblem, device or motto on the shields. 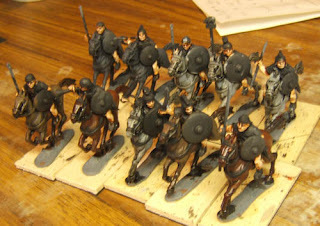 But for now, as with the rest of my Romans, I just want to get a playable paint job on a large number of them. So it will be all solid shields for now. I can go back and add detail. I will do a few more units in black, then I will likely switch to some other colors.